Yesterday my pen was on fire. I dashed off sentences like I knew what I was doing. I went to a workshop and delivered on the exercises. It felt wonderful. Today there’s a sloth in my house and it’s me. I had to drag myself by the hair over here to the desk, which is a nice desk in front of a window, pleasant breeze, sunshine, musical gong announcing something or other. See on a better day, a non-sloth day, that gong would have meaning. Today? Meh, it’s a pleasant sound, not a call to greatness. I can’t plead illness and call in sick, even though I’m my own supervisor, because, truth, I feel fine. I’ve done laundry, tidied the house, walked the dogs, read another solid chunk of Gary Snyder’s poems–usually inspiring. I finished, having savored it and doled it out like bits of expensive chocolate, Marge Piercy and Ira Wood’s book, So You Want to Write. And yes, of course, I do want to write. I almost always want to write. Except today. Today my writer’s brain is comatose. But I might know why. No, it’s not a simple as needing a third cup of coffee. I think it’s that wonderful day I had yesterday. I’m not sure I can duplicate it. No, I’m sure I cannot duplicate it. The writing I did yesterday was a rare confluence of experience, attention, atmosphere, the right prompts and right intention. My job now is not to pale in the face of success, but to savor the gift and keep going. I know that sort of day will rarely come again, but in the meantime, my job, my promise to myself, is to write through the sloth and find balance, not flame throwing, not whining and dallying, just putting one word after the other. So, Friends, I’ll drink my coffee, dig out the drafts that sprang almost fully formed from Zeus’s head and tuck them into their niches. Please do the same. 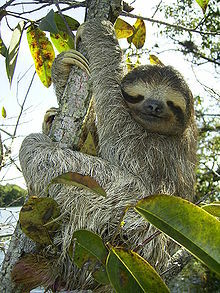 Don’t let the sloths win. This entry was posted in Uncategorized and tagged free advice on writing, personal journaling, sloth, writing life.